State Bank of India (SBI) is an Indian government-owned multinational, public sector banking and financial services company. SBI released Probationary Officer (SBI PO) Recruitment Notification every year during the month of April. This is one of the most expectable opportunities of the aspirants who aim to work with Public Sector Banks like SBI. Because of the Universal appearance in various types of outfits and dimensions of banking, the Job profile of the Probationary Officer in SBI is slightly different from other Public Sector Banks. Basic SBI PO Job Profile involves Banking, Administrative Tasks, and any other tasks conferred by the bank from time to time. Candidate joining as a PO in SBI will undergo rigorous training for 2 years called as a probation period. During the period you will be asked to perform bank related clerical/assistant activities. This is to make you familiar with the working procedure of the bank. You will also be trained in various disciplines like finance, accounting, marketing, billing as well as investment. This is done by entrusting you with jobs of various categories. The aim is to instill practical knowledge. Probationary Officer needs to handle customer complaints and address various customer related issues. Matters such as discrepancies in accounts, rectification of undue charges and looking into complaints regarding services provided by the bank. The work of an SBI PO also includes managerial tasks, such as supervision of clerical work, making decisions for the benefit of the bank, and managing cash balance. The SBI PO Job Profile includes verification of all the work done by bank clerks. SBI follows the maker & checker system. In cash transactions, the clerk is the maker and PO is the checker and the responsibility of losses resides with the checker. A PO in SBI should be aware of all the latest developments of the bank. They are required to read all the circulars and should know about all the decisions taken by the bank management. The SBI PO job profile includes the issue of ATM cards, cheque, and demand drafts. Once you, the Probationary Officer, get acclimatized to the bank environment and gain enough experience on bank’s working procedures, based on your personal skills and aptitude, you can be assigned more responsible work. Tasks like planning, budgeting, marketing, loan processing & approval, and investment management. A candidate joining as a Probationary Officer (Junior Management Grade Scale-I) in SBI could earn up to Rs. 43000 per month approx. This includes Rs. 27000 (approx.) Basic Pay and dearness allowances, CCA (City Compensatory Allowance), and Special Allowances. Anyway, the salary of the SBI PO could vary between Rs. 41000 to Rs. 44000 based on the place of posting. The official will also be eligible for D.A, H.R.A/ Lease rental, C.C.A, Medical and other allowances & perquisites as per rules in force from time to time. Dearness Allowance (DA): It will lie between 30 to 50% of the Basic Pay. In Banks, DA is revised quarterly and is based on the CPI data as revealed by Government of India. CCA: This is paid @ 4%, 3% or 0% depending on the place of posting. 1. Leased accommodation ranges from Rs. 8,000/- to Rs 29,500/-. 2. Home Travel Concession/ Leave Fare Concession. 3. Medical Aid for self (100%) and for family (75%). The total compensation per annum on CTC basis be a minimum of 8.20 lacs and maximum of 13.08 lacs depending on the place of posting and other factors. SBI offers immense growth opportunities. Promotion cycle in SBI is very fast, one can expect his/her promotion in every 3 to 4 years. By getting promotions one can even reach up to the level of chairman of the group. Perfect example for this would be the former Chairperson of the SBI, Mrs. Arundhati Bhattacharya started her career as an SBI PO in 1977. The promotion policy of SBI provides an opportunity to the meritorious and exceptionally brilliant officers to reach the Top Management Grade in a reasonably quick time. SBI also offers Foreign postings to selected officers based on their performances. It has over 190 foreign offices in 36 different countries. Want to Become a PO in SBI? 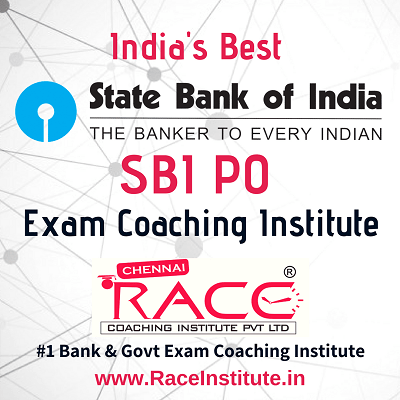 RACE Institute, a pioneer Institute for Bank & Govt Competitive Exams provides the best coaching for SBI Probationary Officer (SBI PO) Examination in all the Branches of RACE Institute. We received “6 Best Competitive Exams Coaching Institute in India” award from Time of India & other organizations like Blindwink.in, Praxis Media, etc. RACE offers Computer Lab, Online Exams, Library, SOLO Lab, Practice Village, 6 Level Practice Programs, Mock Interview and Study Material Handouts with experienced staff members. Students joining to get Coaching for SBI PO Examination in RACE could able to crack all the examinations conducted by IBPS, SBI, RBI, NABARD & Pvt Sector Banks as well as Insurance Examination conducted by LIC, GIC, NICL, NIACL Insurance Companies etc. Because the syllabus of the SBI PO Exams covers almost 80% of the Insurance Exam Syllabus. So, our Banking students could crack Insurance Exams easily with a little more effort. By keeping that in mind, we are offering Bank & Insurance Exam Coaching for just Rs. 13000/-. The Coaching methodology, Facilities & Practice Programs of RACE Institute will surely make you crack SBI PO Exams easily. Want to Become an SBI PO? The selection of the SBI Probationary Officers will be done in three phases i.e. Preliminary examination, Main examination, and Group Exercise & Interview. The candidates who are shortlisted after Preliminary examination of the SBI PO will have to appear for the Main examination. The candidates shortlisted after the main examination will be subsequently called for a Group Exercises & Interview. Category wise merit list will be drawn on the basis of the aggregate marks scored in the Preliminary Examination. Candidates numbering approximately 10 times the numbers of vacancies in each category will be shortlisted for the Main Examination from the top of the merit list. SBI PO Mains Exam Pattern – (Phase II)SBI PO Mains 2018 is divided into two Tests - Objective Test (200 marks) and Descriptive Test (50 marks). Main Examination will consist of Objective Tests for 200 marks and Descriptive Test for 50 marks. Both the Objective and Descriptive Tests will be online. Candidates will have to answer Descriptive test by typing on the computer. Descriptive Test will be administered immediately after completion of the Objective Test. The Descriptive Test of 30 minutes duration with two questions for 50 marks will be a Test of English Language (Letter Writing & Essay). There will be a penalty for wrong answers marked in the Objective Tests. For each question for which a wrong answer has been given by the candidate one-fourth of the marks assigned to that question will be deducted as penalty to arrive at corrected score. If a question is left blank, i.e. if no answer is marked by the candidate, there will be no penalty for that question. Category wise merit list will be drawn on the basis of the aggregate marks scored in the Main Examination. Candidates numbering up to 3 times (approximately) of the category wise vacancies will be shortlisted for the Group Exercise & Interview from the top of the merit list subject to a candidate scoring minimum qualifying score in aggregate. Candidates who are cleared in Descriptive and Objective Exams will be called for Group Discussion and Interview. The Preliminary examination is only qualifying in nature and will not be counted towards the final total. Only Candidates who cleared in phase II are eligible for Phase III. Want to Become Probationary Officer in SBI?